The benefits of using a hydraulic bearing press are multitudinous, too many to list in this short article, but every shop or garage should have one. First of all, it is extremely difficult to find a machine that can match the reliability of a hydraulic press. The machines are efficient and highly functional. Another thing that makes having a hydraulic bearing press is the fact that the operating cost is much lower than when using a non-hydraulic press. There are many more, below you will find several of the top benefits of having a hydraulic press in your garage. One of the primary reasons for having at least one hydraulic press in the shop is because it has full power capacity throughout the stroke. This means that the full power of the press can be delivered at any point of the stroke. Mechanical presses can only deliver full power at the bottom of the stroke, but the hydraulic bearing press delivers equal power throughout. This means that there will be no allowances for reduced tonnage at the top of the stroke. If you are operating a 25-ton hydraulic press, it will only deliver a maximum of twenty five tons, less if you set it for less, no matter what pre-set up mistakes that might be made. This means that there is no concern of an overload, which could lead to a broken press or die. There is a significant cost advantage in choosing a hydraulic press over a mechanical press. Because there are fewer moving parts, maintenance and repair cost are not as high. Usually, breakdowns, on those rare occasions when they do occur, are minor. This is significant when compared to a broken crankshaft on a mechanical press. Greater control and flexibility that can be obtained with a hydraulic press also make it a must have. Regardless of what other machines you have in your garage, it is imperative to have a hydraulic bearing press. 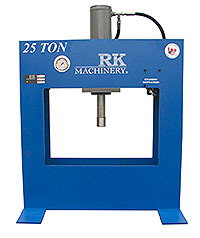 Contact RK Machinery to get more details on this press.